When is a text not a text? When it’s a writing desk. In an email, Dan writes that he’s hesitant to call ATDFL a poem. He thinks maybe ‘fun-with-typography.’ But, though that is true—its funneling type graphs are certainly a type of typographic fun — I think he’s being too modest. To me, this poem enacts writing, a specific performance of letters. Not a moment of oral performance, but a scribal moment. Each experience of ATDFL — because it is user controlled — is a unique per perf perform performative moment. And it’s not the Platonic ideal of a perfect moment, but the wheel thing. Dan notes that “when I showed it to my wife [the writer Jennifer Hill] the first thing she noticed was how many of the letters would form into shapes that were very analogous to how she experiences the letterform. “k” is very jaggedy, “s” is slippery, and the piece as a whole begins with “j” because she loved how the first letter of her name looked (because it looks in this instance not dissimilar to how she experiences it). And I agree with Jenny. There is a kind of reading/language-centered attention that the work evokes. As she observes, it brings out something inherent in the letters that we suspected—or didn’t suspect--was there. Something that corresponds with our understanding or our appreciation of them. Something to do with their sound, shape, symbolic or associational heft. Isn’t this ‘reading’? Because it’s language-related, specific to these particular glyphs — language mark(er)s? Because it's an exploration of the sign and the signifier, of the operation of language? And because it’s an exploration of how we interact with the forms of language? Which font do we prefer? What is our favorite presentation of S? How much should linger after X? Are we serif satisfied or are we sans teeth sans eyes? These spinning typeshapes evoke a wide range of sensory (visual, tactile, auditory) and even verbal associations. There’s certainly much aesthetic pleasure in the images and in interacting with them. A pleasure in the tech. A glyphouissance. Text evoking images? Hmm. That sounds like that thing I’ve heard that poems sometimes do. So, ATDFL, I’m looking at you (as): text, poem. 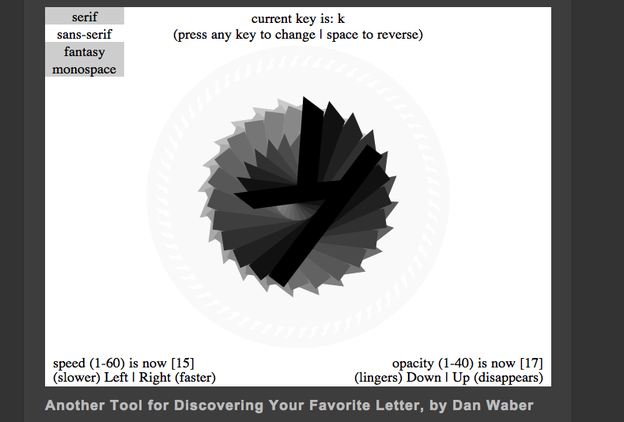 All of the images are screen captures of various iterations of Dan Waber’s Another Tool for Discovering your Favorite Letter. The living, squirling thing can be found here along with other of Dan’s processing pieces. I’d particularly recommend his beautiful The Book of I — a potential book with an ‘i’ for every person on earth. Dan Waber is a poet, publisher, and multimedia artist. More about him and his varied work can be found at his website.